44% reduction in water consumption over EPAct 1992 compliant fixtures. Originally constructed in 1970, Rockefeller Hall is a 26,715 square foot building on the Harvard Divinity School campus. 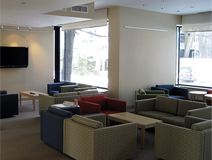 In 2007-8, Rockefeller underwent a complete renovation. The project team was able to creatively redesign the building to meet modern needs, while keeping a large portion of the building mass. In keeping with it’s commitment to sustainability, the Rockefeller project implemented numerous energy conservation measures and pursued certification by the U.S. Green Building Council’s LEED program. Rockefeller achieved a LEED Gold rating in November, 2009.